On a chilly morning and November, thirty people came together to raise awareness for homeless pets at Pima Animal Care Center. They were all riders in the first ever Ride with the PACC team for El Tour de Tucson. 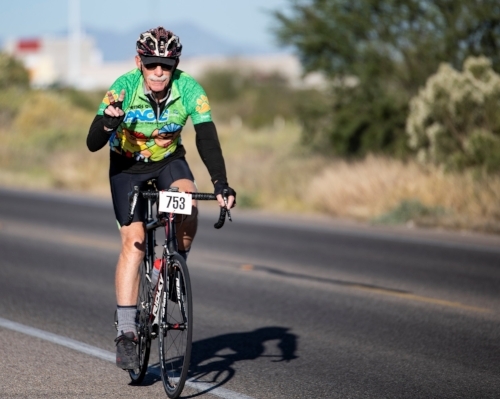 The team brought together people of all ages and abilities to ride in the world-renowned El Tour de Tucson. Riders created individual fundraising pages and shared their own stories about why they chose to ride for homeless pets. 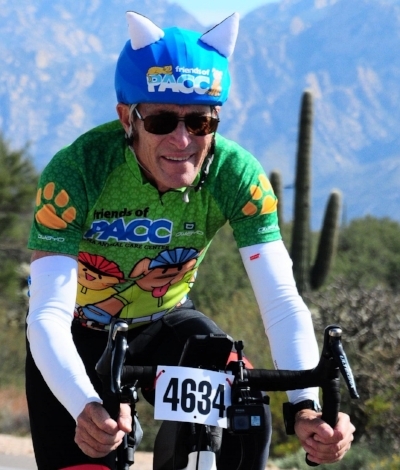 PACC volunteers Jerry Rosen and Ursula Schwarz founded the team to bring together their love of cycling and pets. They were lucky enough to get to share their stories with Tailwinds, one of Tucson’s premiere cycling publications. You can learn more about their inspiration to ride for PACC by watching the video below. Riders raised critical funding for the hundreds of pets in need that call Pima Animal Care Center their temporary home. The team ended up raising more than double the initial fundraising goal of $5,000! All of these gifts will go to the pets at Pima Animal Care Center for lifesaving care including specialty medical treatments, training, foster and adoption programs, and more. We can’t wait for next year! Would you like to receive updates on next year’s team? Email Sara Wolfe Vaughan at Sara@FriendsofPACC.org to get on the list. Some of the Ride with the PACC team at REN Coffeehouse. Photo courtesy of Jerry Rosen. We had to have a little fun along the way, too! Our friends at Evercover donated custom helmet sleeves to raise even more funds and awareness for the pets in our care at PACC. Thank you Evercover! Rider Jerry Rosen sports a custom helmet sleeve donated by our friends at Evercover Helmet Covers.